6-3/4" x 4-3/8" x 1"
Stitches: ch, sl st, sc, dc. Working with two strands at once. R1: Ch 21, dc in 4th ch from hook and in ea rem ch. Ch1, do not turn. R2: (Sc, ch1, sc, ch1, sc) around post of last dc on R1. Sc in ea dc across to last dc. (Sc, ch1, sc, ch1, sc) around post of last dc. Sc in ea dc up other side. Join with sl st in 1st sc made. Ch1, do not turn. R3-16: Begin continuous round. Sc in ea st around placing a marker when each new round begins/ends. After R16, sl st in next st and fasten off. Ch 112, join to form a ring being careful not to twist the chain. Ch1, sc in the hump of ea ch. Join with sl st. Fasten off. Position the handle onto the tote using the photo as a guide. 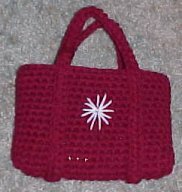 With a yarn needle and a piece of the same color yarn, sew the handle into place on the tote. Using a small amount of a contrasting color yarn, free hand stitch a burst on one side. NOTE:Use any embroidery stitch to decorate your tote... make it yours by adding a button or any other embellishment.